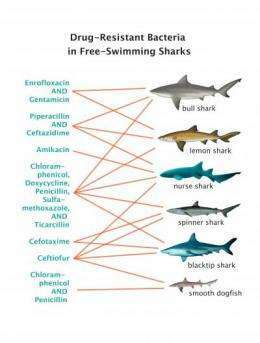 This graphic shows patterns of antibiotic-resistant bacteria in sharks captured in waters off Belize, Florida, Louisiana and Massachusetts. Nurse sharks in Belize and in the Florida Keys hosted the greatest number and diversity of drug-resistant bacteria. Credit: Graphic produced by Diana Yates. Photo credits: Bull shark (NSW Department of Primary Industries); Lemon shark (drawing by Robbie Cada); Nurse shark (modified from photo by Joseph Thomas); Spinner shark (image by Dieno); Blacktip shark (modified from photo by Albert Kok); Smooth dogfish (image from U.S. Fish & Wildlife Service). Scientists have found antibiotic-resistant bacteria in seven species of sharks and redfish captured in waters off Belize, Florida, Louisiana and Massachusetts. Most of these wild, free-swimming fish harbored several drug-resistant bacterial strains. The study, published in the Journal of Zoo and Wildlife Medicine, found antibiotic-resistant bacteria in every fish species sampled. The researchers also found multidrug-resistant bacteria in fish at nearly all of the study sites, said Mark Mitchell, a professor of veterinary clinical medicine at the University of Illinois and a senior author of the paper. "Ultimately the idea of this study was to see if there were organisms out there that had exposures or resistance patterns to antibiotics that we might not expect," Mitchell said. "We found that there was resistance to antibiotics that these fish shouldn't be exposed to." Among the animals sampled, nurse sharks in Belize and in the Florida Keys had the highest occurrence of antibiotic-resistant bacteria. These sharks feed on crustaceans, small fish and other animals living in shallow waters close to shore. Random mutations may account for drug-resistant bacteria in marine environments, Mitchell said, but there is a lot of evidence for a human origin. "The shark population in Belize, for example, is a big tourist area, so there are people in the water right there," he said. "The sampling site is not far from a sewage plant, and so all those exposures we think are playing a role." Sewage also is a problem in the Atlantic coastal waters of the United States, he said. Previous studies have shown that sewage outflows can leak antibiotic-resistant bacteria into the environment. In the new study, the researchers looked for and found bacterial resistance to 13 antibacterial drugs in the fish. Patterns of resistance varied among the sites. Bacteria from sharks off Martha's Vineyard in Massachusetts and in offshore Louisiana were resistant to the fewest number of antibiotics, while sharks in the Florida Keys and Belize harbored bacteria that were resistant to amikacin, ceftazidime, chloramphenicol, ciprofloxacin, doxycycline, penicillin, piperacillin, sulfamethoxazole and ticarcillin. Redfish in the Louisiana offshore site hosted more varieties of drug-resistance than sharks in the same waters. This may reflect differences in their age (the redfish were more mature than the sharks), feeding or migratory habits, Mitchell said. While the presence of antibiotic-resistant bacteria in sharks and other fish does not necessarily harm them, Mitchell said, the findings point to a growing problem for human health. "There are estimates of over 100,000 deaths from infections in hospitals per year, many of them from antibiotic-resistant organisms," Mitchell said. "And we're creating even more of these organisms out in the environment. … Unfortunately, as these things collect, there's probably a threshold at some point where there's going to be a spillover and it will start to affect us as a species." People do eat sharks and redfish, Mitchell said, and now these fish represent a potential new route of exposure to drug-resistant bacteria. Sharks and redfish also are predators, and so may function as sentinels for human health. "Some people might say, well, a bull shark in offshore Louisiana doesn't really have an influence on my health," Mitchell said. "But these fish eat what we eat. We're sharing the same food sources. There should be a concern for us as well." Way to kill the planet guys! Keep of the good work, your species will be wiped out within the century! Then it's all ours! Long live the Alpha Centari Empire!